At that appointment I found out that Eloise most likely has either Cerebral Palsy or a muscle disorder called Dystonia. The Doctor talked about treatment options such as casting, botox, a leg brace, and physical therapy. But, since we knew we were moving to Florida soon, we didn’t set up any follow up appointments. Fast forward to today where I was finally able to get Eloise in to the specialist she needed to see here in Florida. We moved to Jacksonville 6 months ago but we are just now being able to get her treatment. It took us a while to get her Florida insurance, and then to get her a primary care physician and then to get her referred to a specialist who then referred her for serial casting. But the referral for serial casting got lost and, well, long story short, I’ve been trying for the last 6 weeks to get her an appointment… to no avail. Thankfully, Drew’s dad works at the hospital and he was able to help us figure out what was going on and help us get things moving. (As a side note, way to go West Michigan for incredible speed, customer service, and organization in regard to heath care! You have got Jacksonville beat by leaps and bounds!). After months of waiting, I called the hospital yesterday and they had finally received her referral and BOOM! appointment the next day. Praise the Lord! Eloise’s appointment went well. Drew’s cousin, Frannie, graciously came with me at the last minute to help me with the kids. Life saver!! Eloise does not do well with doctors but with some cookies and a movie on my phone I was able to convince her to stay still long enough to get the cast on. The type of cast she has on is called a serial cast. It is softer than a regular cast and it only stays on for five days. At the end of the 5th day we take it off at home, she is cast free the 6th day, and then we return to the doctor on the 7th day for another cast. She will get a total of 6-8 casts, each one flexing her foot slightly more to help her obtain better range and learn to walk the correct way. After the cast comes off she will need to wear a brace for several months and have 6-8 weekly physical therapy visits to help stretch out her muscles and prevent them from relapsing. If you’re keeping track, that’s about 4 months of weekly doctors visits I have scheduled in my planner….. not the most fun thing when you have three little ones in tow!! We also may have to repeat the casting in 6-12 months, depending on how things go. We’ve got a long road ahead but we are thankful for modern medicine and doctors who can help our sweet Eloise walk a little better! On our way home from the Doctor’s office! As of right now we are uncertain if she has Cerebral Palsy or Dystonia (or possibly something else). Both disorders are most likely the result of a brain injury while either in the womb, during birth, or shortly after birth…all times before she was in our care. She is normal or ahead of schedule in all other areas mentally and developmentally. Her sole issue right now is with her right leg and foot. We have an appointment with a neurologist in two weeks to run some tests and do some scans to see if we can get to the root of the problem. When we find out more about what is causing the issue I will share more information about what the future holds. We got the cast put on this morning and so far Eloise hasn’t been complaining. 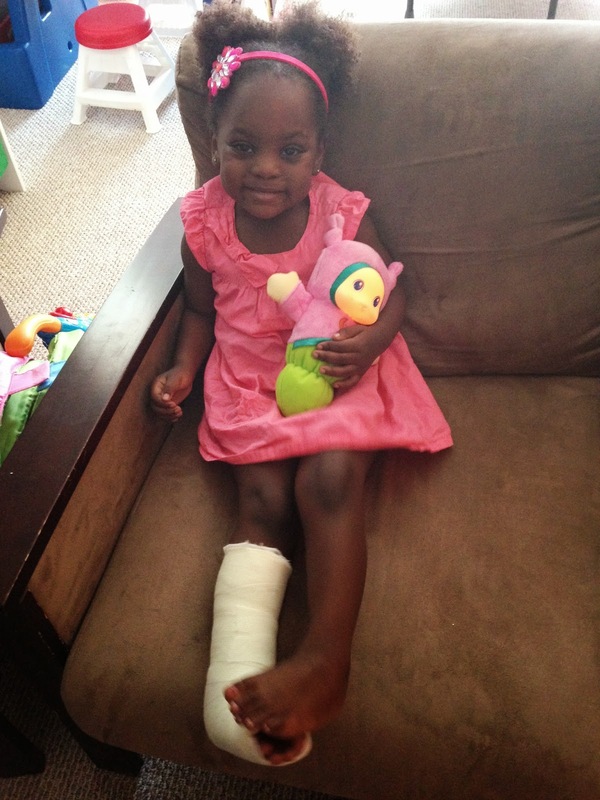 They gave her a cast shoe to use which helps her walk better. We’ll see how she does at night. We are suspecting that it may get a little uncomfortable for her, especially in the coming weeks when her foot is stretched to more uncomfortable positions for her. One positive thing is that she can decorate and color her cast however she pleases. 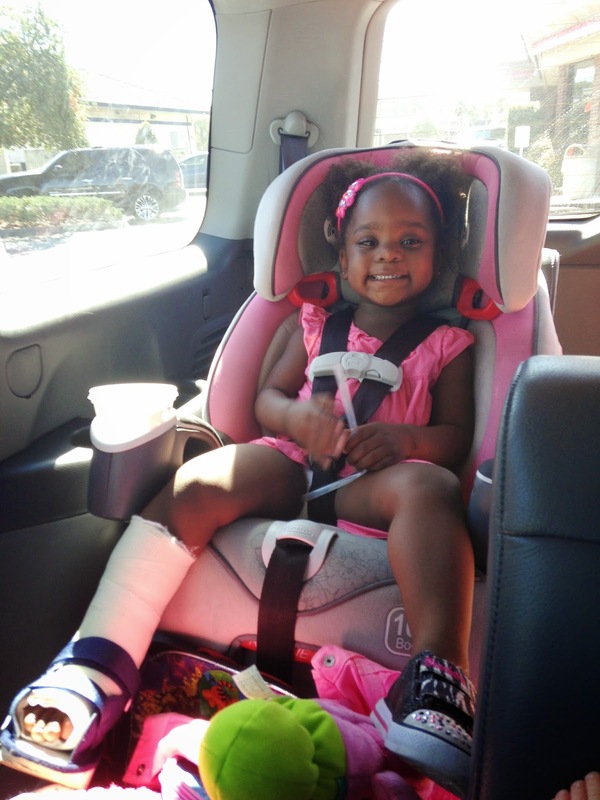 And each week she will get a new cast to design a new way…. 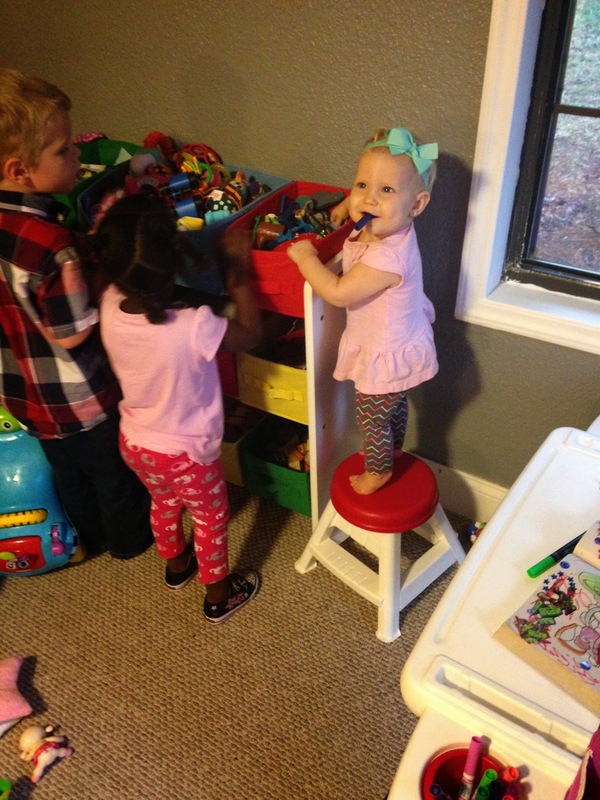 great news for a girl who loves to color! Please keep her in your prayers as you think about it! Eloise is very scared of doctors and the whole process is hard for her! Thank you! 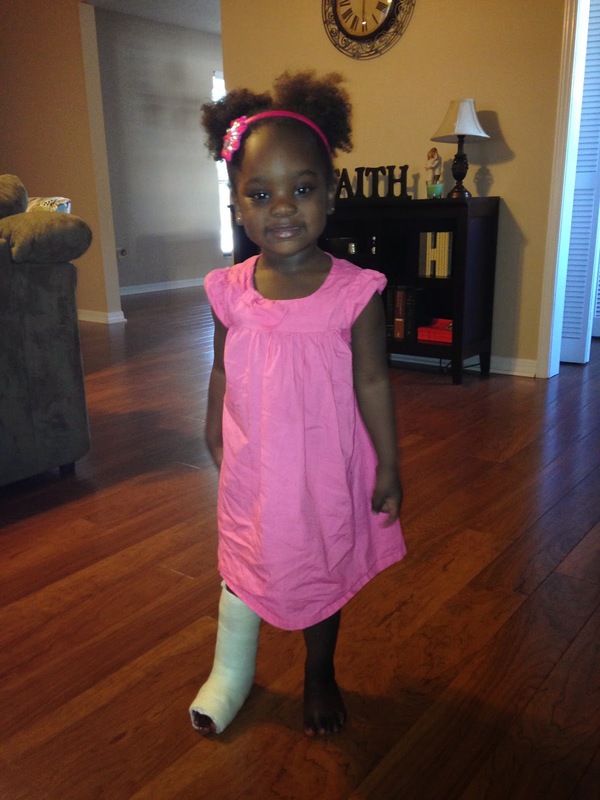 It took her a little while to learn how to walk on it but she’s doing great now! TEN MONTHS!?!? No way!! I’m not going to write it!! No way can my baby be 10 months already! I’m trying to savor all of Olive’s baby sweetness as this baby becomes more and more of a toddler every day! Olive is such a joy and delight and we feel so honored that God chose us to be her family. Here’s Olive enjoying one of Isaiah’s old toys from when he was a baby. Isaiah never took as much interest in it as she does. Livy loves it! Height & Weight: Olive is 20.2 pounds and TALL! Eating: Loving Mama’s milk and nursing several times a day. Eating all table food. We try to sneak in some babyfood every now and then since we have a cupboard full but she pretty much always refuses it in lieu of something that tastes better. Smarty pants! Did I mention that she likes food? This girl loves her blankie! Sleep: Finally, we have some structure going on around here and Olive is sleeping an average of 11-12 hours straight through the night!! Occasionally she will wake up around 5 and want to nurse but often times sleeps straight through to 7 am. Halleluiah! 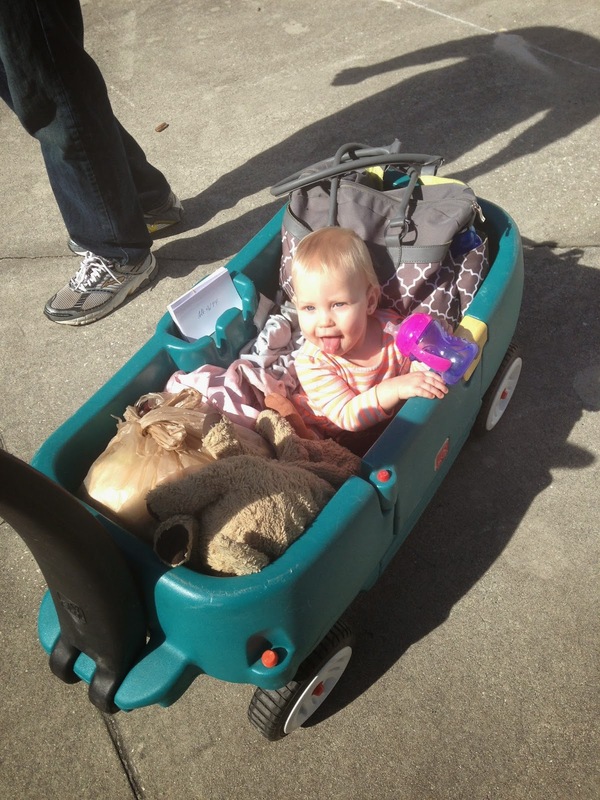 Olive has pretty much slept in a pack n play since she was born because of all the moving around that we did! 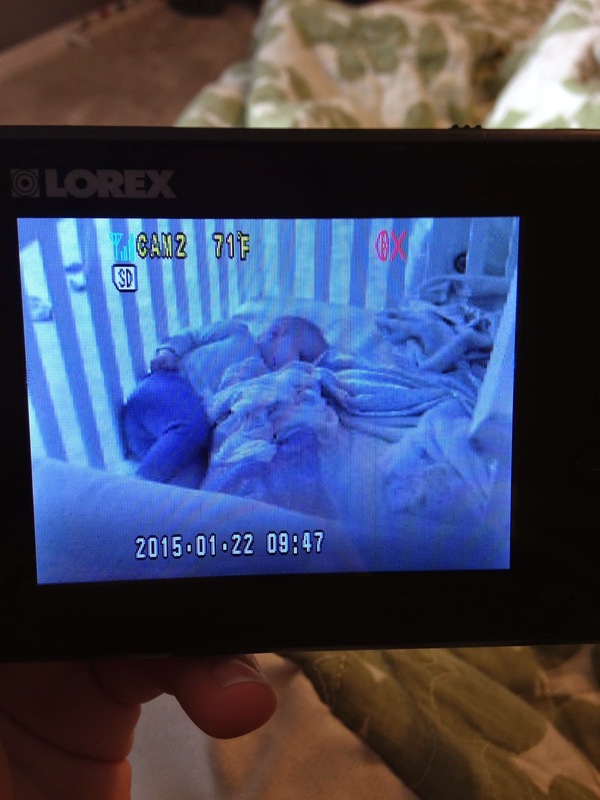 We finally got her crib set up this month and this is her on the baby monitor taking her first nap in it. It took her a while to fall asleep but now she sleeps great in her big girl room! 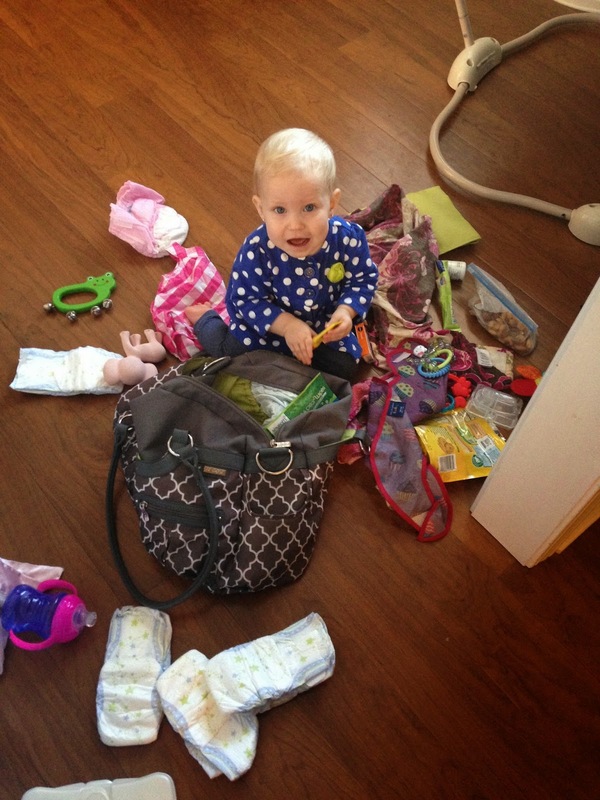 Personality: Livy is a busy girl! Always getting into something these days. She loves to laugh and play peek-a-boo type games with people. She is a snuggler and loves to lay her face on your chest. She continues to be a sweet sweet baby and we’re all smitten. 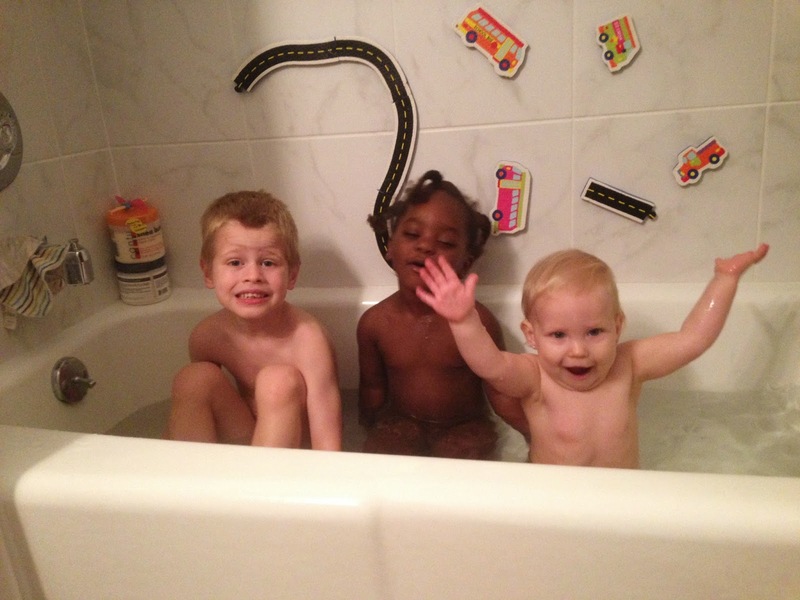 =) All of us, even Zai and Ellie, love having a little baby in the house! 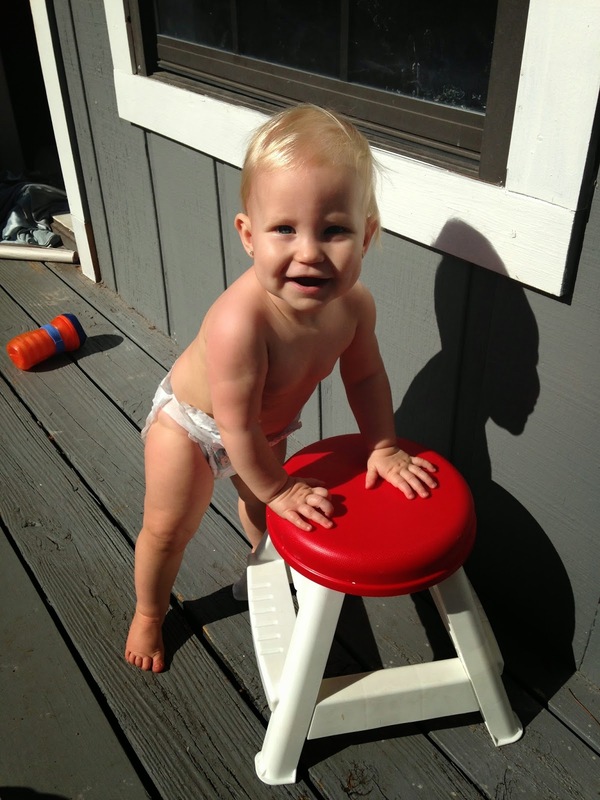 Milestones: So…. We thought for sure Olive would be walking by 9 months. Guys, she is so so so so close. She gets up to a standing position from the floor without holding on to anything! She can walk a step or two. But then she doubts herself and gracefully drops down and goes back to crawling. She’ll walk from one piece of furniture to the next if she knows she can make it but she just doesn’t have confidence to full out walk yet! She has been learning lots of sign language this month- all done, more, please. Also she learned to raise her hands when we say, “How big are you? SO big!” She knows my name now and crawls around the house shouting “MAMA! MOM! MAMA!” when she can’t find me. 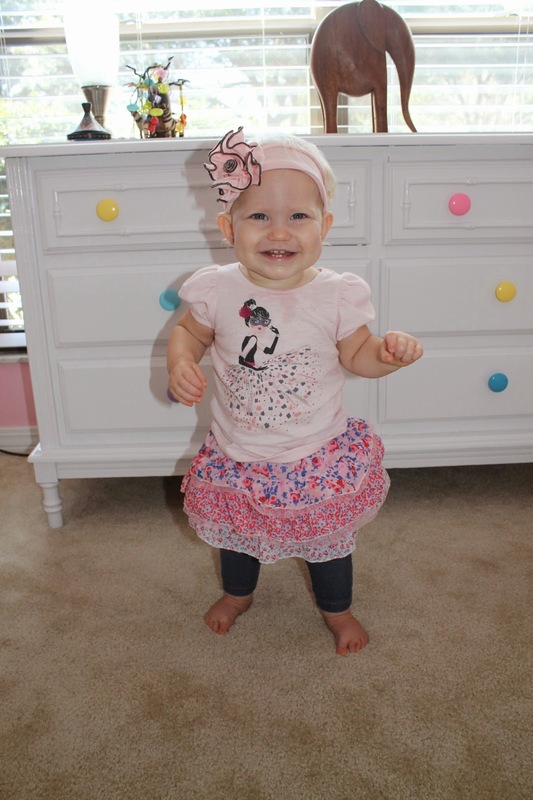 She waves “hi” and “bye-bye” and can say, “uh-oh.” She has 8 teeth, wears size 3 diaper, and size 9-12 or 12 month clothes. Family walk to the park! Isaiah and Eloise: I can’t tell you the number of times that Isaiah says to me, “Awww Mom, Baby Olive is so cute.” =) And the number of times Eloise grabs and hugs and kisses her. They both love her so much (except when she’s getting into something they’re doing or building or eating….). But for the most part they all get along well and I’m grateful! 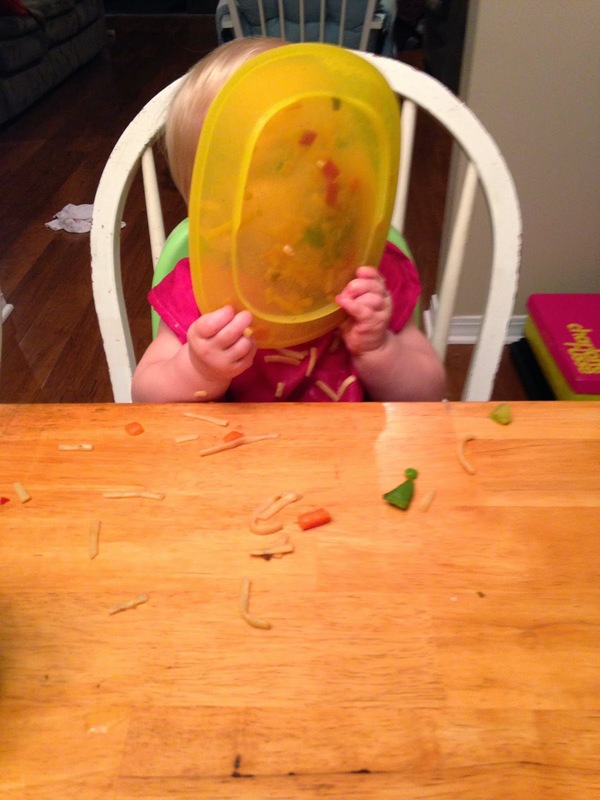 Olive has started copying the things Eloise and Isaiah say and do. You can see the wheels in her little head spinning as she takes in all that they do and then tries to do it herself. 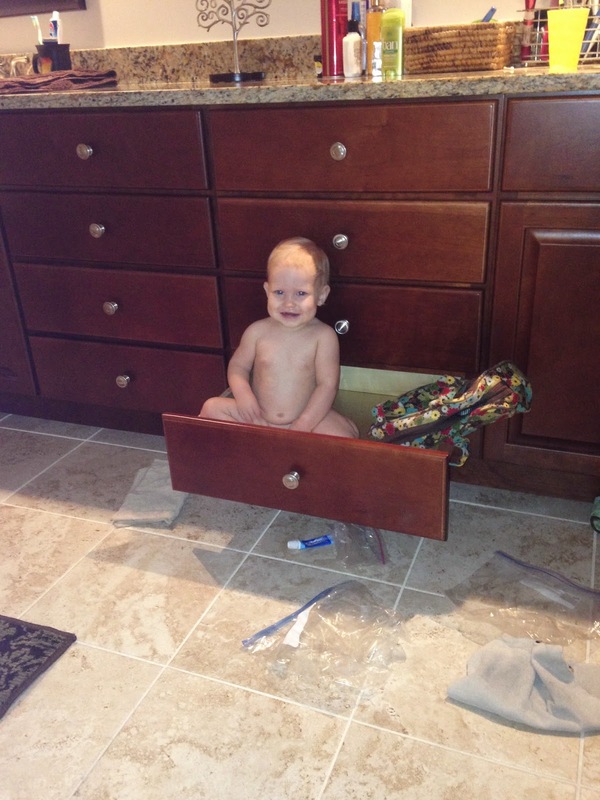 Thankfully she has some good roll models to look up to as she grows up! 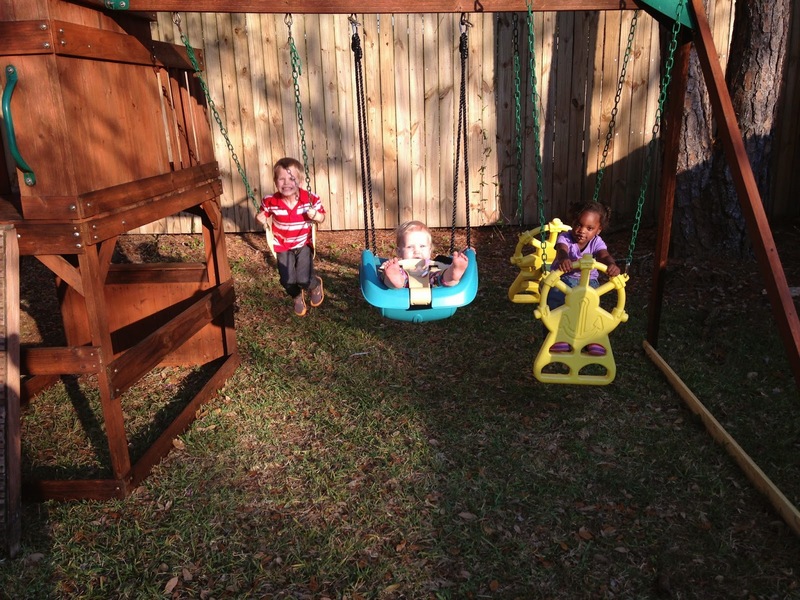 The kids love their playset from Grandpa!! 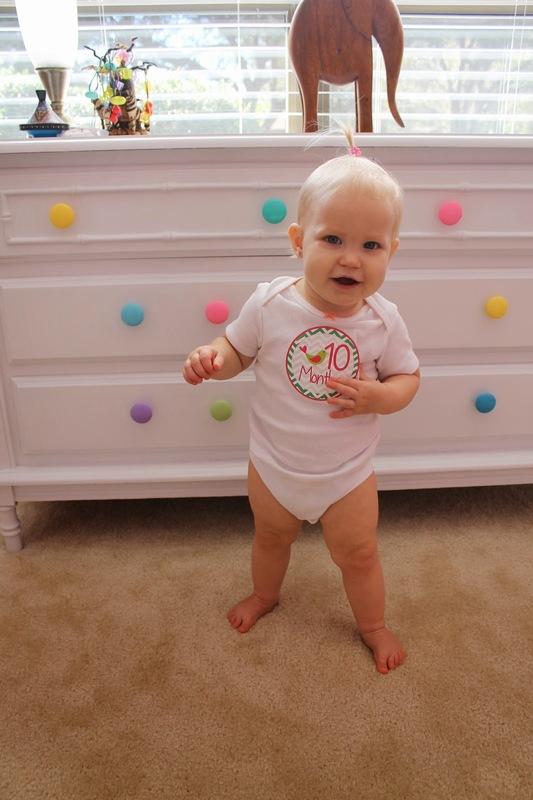 HAPPY TEN MONTHS, BABY GIRL!